The monastery was built in the years 1833-1835 by three Transylvanian monks that returned from Mount Athos: Visarion, Gherotie and Isaiea. In 1842-1843 the first building is enlarged. 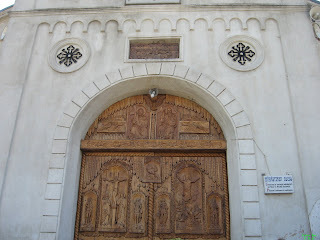 In 1853, thanks to a donation made by Nicolae Hagi-Ghiţă Poenarul, a new church was built, which stood up until 1911. The belfry and two adjacent rooms were built between 1864 and 1883, hosting a printing press from 1911 until the First World War. The eastern side was built between 1905-1910, while between 1910 and 1911 the 24 cells were constructed. All these constructions belong to the neo-romanian architectural style, promoted by Ion Mincu's school of architecture.In the beginning of the 19th century, both the church and the inside pavilions were refurbished according to the plans of architect Toma Radulescu. The church painting is the work of Italian artist F. De Biasse and of local iconographer Geo Cardas (who painted the porch). 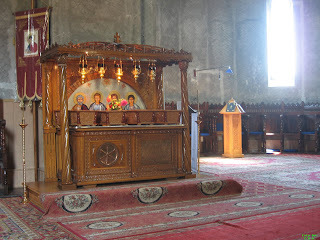 The monastery museum has an important religious book collection, gathered from all the parishes of Tulcea county. Besides the impressive collections of fine and decorative art, archaeological findings and old coins, the monastery shelters the bones of old Christian martyrs Zotic, Attal, Kamasie and Filip (most probably from the years 303-304). 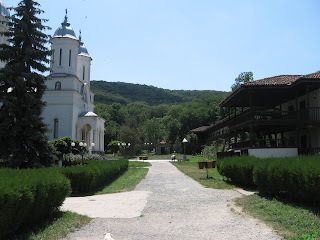 In 1971 in the Niculiţel village was found a Paleo-Christian compound, including a basilica built in the time of Emperors Valens and Valentinianus. Inside the crypt covered by a hemispheric cupola with pendants were found two martyr tombs: at the lower level there are two human skeletons, whose names are not known, while at the higher level, in a collective coffin, the skeletons of four martyrs: Otiose, Attalos, Kamasis and Philippos. The monument was restored and is protected by a construction set up around it. Some info about the discovery can be found here, while the location is here. 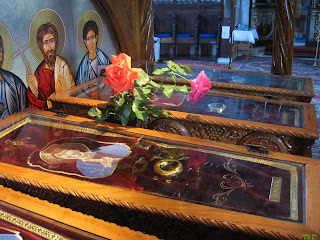 Below are two photos of the crypt from Wikipedia. 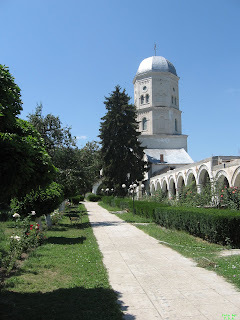 Some more info and photos regarding Cocoş monastery can be found an the Romanian Monasteries website and here. The (low-res) satellite view can be found here and some photos below (an old aerial one and the rest personal photos).